There is not yet any macroeconomic analysis of Ebola’s impact on West Africa, with IMF figures only indicating a modest decrease in growth for Liberia, Sierra Leone and Guinea. But NGOs on the ground describe the situation as “catastrophic”. Amara Konneh, Liberia’s minister of finance, recently said that his country’s projected gross domestic product (GDP) growth in 2014 would need to be revised downwards from the 5.9% forecast, as a result of the crisis. Reacting to a US$52 million (€40 million) grant provided by the World Bank, Konneh said the government needs about US$200 million (€156 million) to fight the Ebola epidemic, and bring Liberia out of recession. According to the IMF, the projected growth rate could decline for Sierra Leone from 11.3% to 8%, for Liberia from 5.9% to 2.5% and for Guinea from 3.5% to 2.4%. The IMF admits that the situation is evolving, and that the crisis is not over yet. All the three countries are covered by IMF programs. The reality on the ground appears to indicate that the IMF needs to revise its figures. Meinie Nicolai, President of Médecins Sans Frontières (MSF) Belgium, told EURACTIV that the epidemic was having a major impact in the affected countries in Western Africa and called the situation catastrophic. She insisted that the international response to the emergency was “below standard” and “way too slow”. Nicolai, who just returned to Brussels from Liberia and Sierra Leone, said that it was important to remember that the epidemic was still spreading, that it is highly deadly, and that she could not predict when it would be contained. “[Ebola] has a major impact on society. It’s contagious and extremely fatal. It creates enormous fear among the population and has a paralysing effect on countries,” said Nicolai. The MSF chief painted a picture of economic collapse, with investors leaving the afflicted countries, a drop in incoming goods, and health infrastructure collapsing, especially in Liberia. “In Liberia, before the Ebola outbreak there were 11 airline companies flying to the country. Now there are only two international companies left. Ports have reduced access. Borders have been closed between Liberia and Sierra Leone, the trade between them is reducing. Prices will go up. There will be problems for the governments in terms of cash flow, for paying salaries etc. The impact is enormous,” Nicolai said. Asked what she thought about the IMF figures, she explained that it was not up to her or to MSF to discuss macroeconomics. But Nicolai insisted that it was a major crisis, and that there was “a crisis inside the crisis”, in which the entire health system was collapsing. “Hospitals are closing, because, as hospitals become places of infection, staff are scared to come to work. Patients don’t come for other treatments, so people die from other diseases,” she said. Nicolai also said she had heard prices will increase, that entrepreneurs are leaving the country, and that there will be cash problems. But she was unable to put figures on this. Nicolai said that the MSF have been calling for “hands on the ground” to build hospitals and to help set up treatment centres for patients. If patients are not isolated, the epidemic will continue to grow. “Vaccines and medications are not available today, they will not be available tomorrow, so we will have to deal with the situation as it is,” she said. A European Commission official, who asked not to be named, said they realised that few facts on the economic situation in Ebola-affected West African countries were available. “We only have pieces of information which suggest a worrying picture, but what we don’t have is an overview analysis, which normally the IMF and the World Bank do, on the macroeconomic situation. They are not yet in a position to do it, because we are in the middle of the crisis,” the official said. In addition to humanitarian aid it provides to the countries concerned, the Commission launched a €140 million response package, nearly €100 million of which will be delivered as budget support to the governments of Liberia and Sierra Leone. Reportedly, the government of Liberia has concerns over its ability to pay salaries for October. A Commission deputy director general is at present on the ground in the countries concerned, for contacts “at the highest level”, EURACTIV was told. “We should isolate the disease and not the countries concerned”, the Commission official said. The Ebola epidemic, the worst since the disease was discovered in 1976, has killed some 2,100 people in Guinea, Sierra Leone, Liberia and Nigeria and has also spread to Senegal. Ebola is a haemorrhagic fever spread through the blood, sweat or vomit of those infected, making those working directly with the sick among the most vulnerable to the disease. The WHO believes it will take six to nine months to contain and may infect up to 20,000 people. In Liberia, the disease has already killed 1,089 people - more than half of all deaths reported since March in this regional epidemic. F14 of Liberia's 15 counties have reported confirmed cases. As soon as a new Ebola treatment centre is opened, it is immediately swamped with patients. 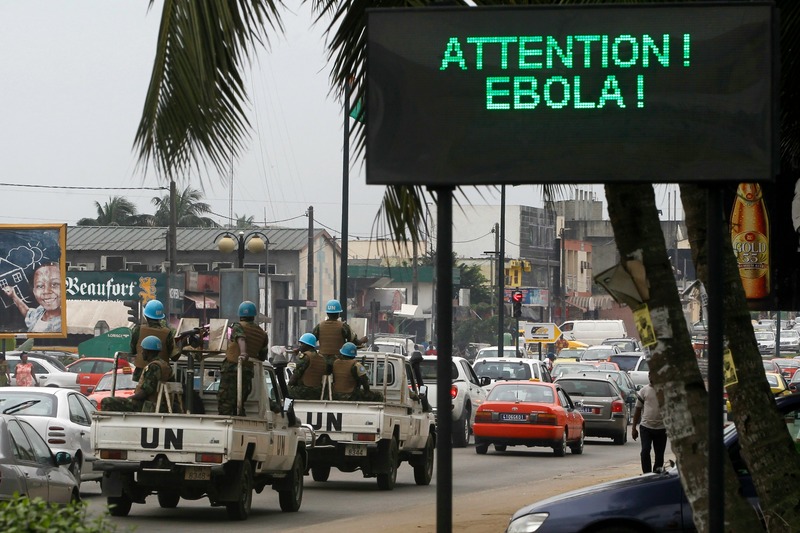 Liberia's government announced it was extending a nationwide nighttime curfew imposed last month to curb the spread of the disease. Sierra Leone ordered a four-day countrywide "lockdown" starting 18 September as part of tougher efforts to halt the spread of Ebola.